To Sum It Up: It is official: Great Britain has just joined the war, siding against Austria-Hungary and Germany and complicating Prince Aleksander's stay on the Leviathan. Although only the perceptive Doctor Barlow and the trustworthy midshipman, Dylan, know of Alek's true identity, the captain suspects Alek and his men of being Clankers. Even after saving the dying Leviathan and its crew, Alek and his men are deemed the enemy and are not allowed to leave the ship under any circumstances. This confinement allows the friendship between Alek, the heir to the Austro-Hungarian throne, and Deryn Sharp, a commoner girl disguised as a boy in the British Air Service, to grow. When Alek is forced to escape from the Leviathan when it lands in Constantinople, a neutral country in the war, their friendship is tested. The Leviathan's peacekeeping mission fails, and Deryn is given the opportunity to join and help the young prince she loves. Alek has the ability to stop the war, especially now that he has a band of rebels as allies, and the help of one fearless Mr. Sharp. Review: I can't convey in words how excited I was to read this book. And let me tell you, it was worth it! 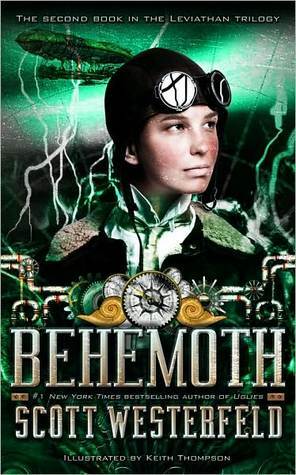 Behemoth is just as amazing as the first book, Leviathan. Behemoth kicks off with a rocking start, picking up where the previous book left off. Alek is on board the Leviathan and is with Deryn! Deryn is obviously crushing on the Clanker prince, and Alek is obviously clueless. I can't tell you how frustrated I get sometimes. At points, it looks like either Alek is going to figure out that Dylan is actually a girl or that someone is going to blurt out Deryn's secret, but it just doesn't happen. Ughh, those two need to get together! They would be perfect for each other. Then again, Deryn is a commoner, and somehow I don't think Alek would do that to his own kids, marrying a commoner, even if he does love her. It’s just not going to happen. Anyway, no matter how frustrated I get, I still love them! Deryn and Alek were extra cool in this book. They each had their own struggles which they had to overcome and then they had their "as a team" struggles, which they demolished! To me, the action in this book just got better! And the illustrations! They are still beautifully crafted and enjoyable! I look forward to those things in each chapter. They just seem to add to the story. Speaking of the story, the plot of this book was really intriguing. I liked the idea of Alek having to fly solo and Deryn facing the decision of joining him or not. The whole idea that the misfit prince and commoner girl can stop a world war is kind of kick-arse! And the whole rebel thing was uber cool. That is my kind of thing! I also liked the introduction of new places, people, machines, and yes, beasties! Doctor Barlow always keeps me thinking. She is just so shady. And now I have to keep an eye on Count Volger too! Who thinks Barlow and Volger would make a good couple? I do—that would be so fitting! All in All: Behemoth was just as mind-blowingly awesome as Leviathan. I don't think Westerfeld could disappoint readers if he wanted to. Needless to say, I have already gotten my grubby hands on the next and final book in the series, Goliath. I am so psyched to read Goliath and highly recommend the Leviathan series to everyone!